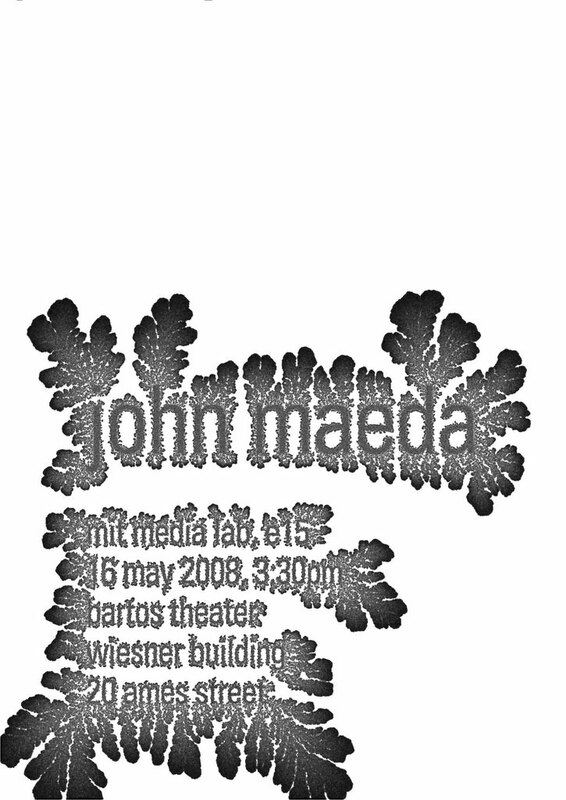 John Maeda's current and former students (from his ACG and PLW graduate research groups at the MIT Media Laboratory) were invited to create posters for his farewell lecture at MIT, which took place on May 16, 2008. Using a diffusion-limited aggregation simulation technique borrowed from my Dendron project (2000), my poster image took about 68 minutes to "grow". Computational design, generative design, diffusion-limited aggregation, DLA, poster, typography, letters, type, morphosynthesis, growth, form, black-and-white, organic, simulation. The full-resolution version of my poster can be found here, on my Flickr site. Posters by other Maeda alums and students include this one by Casey Reas; these by Justin Manor; and this collection created by Luis Blackaller and others. The poster programme was organized by Amber Frid-Jimenez.